English rabbi; born in London Aug., 1821; died March 11, 1883. A precocious student, at the age of fourteen he was successful as candidate for the post of reader in the Great Synagogue, and at seventeen was appointed minister of the Bristol congregation. One of his first compositions, entitled "Dr. Croly, LL.D., versus Civil and Religious Liberty," 1850, was an attack on Dr. Croly, who had opposed the admission of Jews to Parliament. In March, 1851, Green was elected second reader of the Great Synagogue, London; and when in 1855 the Old Portland Street branch synagogue was opened, Green was elected its first reader and preacher. In that capacity he made many improvements in the service of the synagogue, and for nearly thirty years cooperated in all the new movements that helped to organize the London Jewish community. 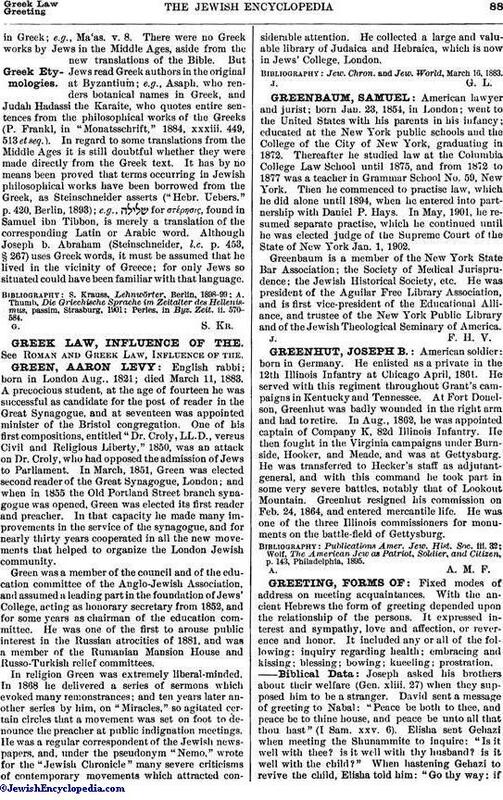 Green was a member of the council and of the education committee of the Anglo-Jewish Association, and assumed a leading part in the foundation of Jews' College, acting as honorary secretary from 1852, and for some years as chairman of the education committee. He was one of the first to arouse public interest in the Russian atrocities of 1881, and was a member of the Rumanian Mansion House and Russo-Turkish relief committees. In religion Green was extremely liberal-minded. In 1868 he delivered a series of sermons which evoked many remonstrances; and ten years later another series by him, on "Miracles," so agitated certain circles that a movement was set on foot to denounce the preacher at public indignation meetings. He was a regular correspondent of the Jewish newspapers, and, under the pseudonym "Nemo," wrote for the "Jewish Chronicle" many severe criticisms of contemporary movements which attracted considerable attention. He collected a large and valuable library of Judaica and Hebraica, which is now in Jews' College, London. Jew. Chron. and Jew. World, March 16, 1883.